Aims—To examine the effects of rapid weight loss on mood and performance among amateur boxers. Methods—Participants were 16 experienced amateur boxers. In stage 1, structured interviews were used to assess the type of strategies that boxers used to reduce weight and the value of performing at their desired weight in terms of performance. In stage 2, boxers completed a 4 × 2 minute (1 minute recovery) circuit training session. Boxers completed the circuit training session on three different occasions with a week between each. The first test was used to familiarise the boxers with the circuit training task; the second and third tasks were at their training weight and championship weight, respectively. Participants were given one week to reduce their body weight to their championship weight using their preferred weight making strategies; boxers reduced their body weight by an average of 5.16% of body weight. Results—Boxers typically lost weight by restricting fluid and food intake in the week leading to competition. Repeated measures multivariate analysis of variance results indicated that rapid weight loss among boxers was associated with poor performance, increased anger, fatigue, and tension, and reduced vigour. Conclusions—Strategies used to make weight by boxers are associated with poor performance and a negative mood profile. Weight making is an integral part of boxing. The present study found that boxers use strategies to lose weight rapidly in order to make their championship weight. Results show that boxers' rapid weight loss is associated with under achievement and negative mood. The above quotation is typical of competitors who compete in individual combat sports including boxing. The logic behind reducing body weight down to a minimum is based on a belief that an advantage will be gained over an opponent competing at his/her natural weight. Also, there is a tendency to believe that eating and drinking in the period following the weigh-in before the contest can restore strength. Despite a wealth of anecdotal evidence, scientific research to examine the consequences of strategies used to make weight in boxing is sparse. The purpose of the present study was twofold: firstly, to investigate the perceptions of boxers towards making weight, including identifying what boxers do to manage weight. The second purpose was to examine the effects of rapid weight loss on mood state variables, and performance on a circuit training exercise that was designed to simulate the demands of amateur boxing contest. A limitation of previous research may be that it has tended to investigate the impact of weight loss on performance in laboratory settings rather than real life settings. Although laboratory research can allow for strict control of potentially confounding variables, the generalisability of such findings to real life settings is questionable. In real life settings, it is likely that individuals will have to reduce different amounts of weight in order to make their competition weight. It is also likely that each individual will have a preferred strategy to enable this weight loss. Thus if research findings are to have an influence on practice, the research should be conducted in ecologically valid settings. To date there has been an absence of research investigating the perception of boxers on the value of using weight making strategies. Logically, it might be possible to make the assumption that the reason a boxer reduces weight is on the basis that this will increase his chances of success. However, the notion that reducing body weight down to a minimum on the basis that an advantage will be gained is flawed if reducing weight leads to poor performance, as suggested by previous research. Thus, it is suggested that research should investigate the impact of weight making strategies on psychological states in order to reduce the amount of speculation that currently exists. The exploratory nature of the present study made setting hypotheses difficult. The first part of the present study explored boxers' attitudes towards weight making. The second part tested the effects of making weight on mood. Consistent with previous research among wrestlers, we hypothesised that rapid weight loss would be associated with poor performance2–10 coupled with increased anger, confusion, depression, fatigue, and tension, and reduced vigour. The present study attempted to maintain ecological validity through involving boxers in the design of the study. 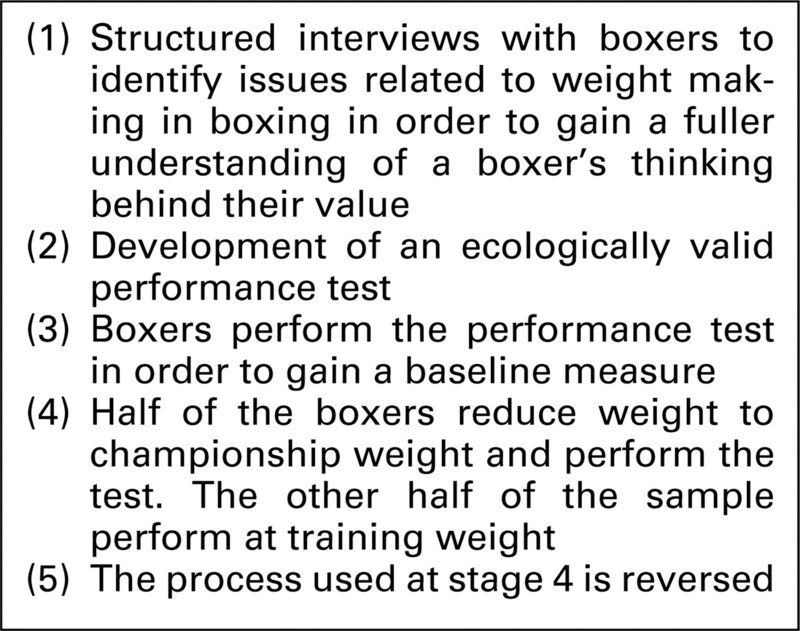 In stage 1, structured interviews were used to identify issues related to weight making in boxing in order to gain a fuller understanding of a boxer's thinking behind their value. Interviews were also used to develop an ecologically valid performance test. In stage 2, boxers completed the performance test designed by the sample in stage 1 (see fig 1). Sixteen amateur boxers (mean (SD) age 23.5 (4.8) years) volunteered to participate in the study and signed consent forms. Participants had an average of 5 (SD 2.67) years experience of competitive boxing. (We define competitive boxing as competing where there is a verdict. This should be distinguished from sparring where there are no judges, referee, or a verdict. Sparring did not count as previous experience and neither did the number of years spent learning to box before the first contest.) We set an inclusion criterion for participants in this study of a minimum of two years of competitive boxing experience. The rationale for this inclusion criterion was so that participants would have sufficient experience of weight making. We used the number of years competing rather than the number of contests because it is possible to weigh in for a contest and not compete (for example, the opponent weighing in too heavy or too light). Participants needed to be over 18 and less than 35 years of age. All were required to be currently in training, and express the desire to compete in the next three months. Boxers reported to train for an average of 12 (SD 5.00) hours per week. Participants ranged in weight from flyweight to heavyweight (mean (SD) 67.87 (10.50) kg; see table 1). Super-heavyweight boxers were excluded from the study as there is no upper weight restriction on the super-heavyweight division. It is acknowledged that the strict criteria for including participants in the present study reduced the potential sample size. Structured interviews were conducted to investigate boxers' attitudes towards weight making. Participants were asked to describe how they managed the issue of competing in weight categories. This included asking boxers to state the extent to which their weight varied throughout the course of a season. Secondly, boxers were asked to describe what methods they used to make weight; and thirdly, boxers were asked to describe whether they felt that using weight making strategies influenced performance. Boxers were interviewed to develop a performance task. A circuit training task was used rather than a competitive boxing task such as shadow boxing, punch bag work, or sparring as boxers indicated that it is difficult to control the quality of work in these activities. For example, if the number of punches thrown in a round was used as the performance measure, boxers reported that they could throw fast punches with reduced power in order to get a high score. Boxers reported that a circuit training task would be the most appropriate as circuits were already an integral part of training. The performance comprised a 4 × 2 minute (1 minute recovery) circuit training session, which is consistent with the number and duration of rounds in an amateur boxing contest. The session comprised a burpee (a press-up followed by standing up) and press-up being performed continuously. The performance measure was validated by boxers completing the task and then commenting on the extent to which the physical demands were similar to those experienced in an amateur boxing contest in order to determine whether the performance measure was valid for the present study. Mood was assessed using the Profile of Mood States–A (POMS-A).22 The POMS-A assesses anger, confusion, depression, fatigue, tension, and vigour. Anger items include “bad tempered” and “angry”; confusion items include “mixed up” and “uncertain”; depression items include “depressed” and “downhearted”; fatigue items include “worn out” and “tired”; tension items include “worried” and “anxious”; and vigour items include “alert” and “energetic”. Items are rated on a five point scale anchored by “not at all” (0) and “extremely” (4). Validation of the POMS-A involved 1693 participants from two populations: schoolchildren and athletes. Confirmatory factor analysis supported the factorial validity of a 24-item, six-factor model using both independent and multisample analyses. In addition, the POMS-A has shown concurrent validity with correlations between POMS-A scores and previously validated inventories showing relations that are consistent with theoretical predictions. Scores on the POMS-A are transformed into standard T score format (mean 50, SD 10) from normative data from athletes reported by Lane and Terry, and Terry et al23 (Construct validity of the profile of Mood-States-A for use with adults (submitted)). Posters displaying information regarding the study were placed on the walls of amateur boxing clubs in the London region. Boxers were required to contact the first author of the paper. Participants were informed that the purpose of the research was to look at methods of improving performance in championship competition. No financial incentives were offered. Boxers were informed that they had to be available to be tested on three different occasions, with one week between each test. Boxers had to be prepared to drop to an agreed weight in one week. To control for a possible learning effect, in week 2, half of the sample completed the performance task at the training weight with the other half completing the performance task at their championship weight. The order was reversed for week 3. It is acknowledged that reversing the order of weight loss for half the participants introduces an entirely different unanticipated effect, which is whether the sequence of weight loss affects performance. A limitation of the present study is that it is not possible to discern the influence of coming from a higher or lower weight when performing at training weight, with regard to mood or performance. To simulate the demands of the weigh-in, boxers were informed that they had to make a certain weight by a specified time. Following this, boxers were given a two hour period before performing the performance task. This period of time between the weigh-in and the start of the competition is typical of that used in amateur boxing championship competition. To ensure performance tests were conducted under consistent conditions, a number of different steps were taken, including: (1) participants were not given any encouragement during performance; (2) tests were performed at the same time of day; and (3) tests were performed individually to avoid interpersonal competition. Participants completed the POMS-A and the number of repetitions that they set as a goal one hour before performance. Prior to completing the questionnaire, participants were informed that there were no right or wrong answers, and that they should choose the answer which describes how they were feeling at that moment. Interview results reported that they have four phases in their weight control programme: natural weight; training weight; interclub competition weight; and championship weight (see table 1). For example, a light-welterweight boxer reported that his natural weight was 70 kg. When he starts training his weight will drop to 67 kg and he will compete in an interclub competition at 65 kg. However, he would compete at 63.5 kg in championship competition. Thus he would reduce his weight by 7 kg from his training weight in order to make his competition weight. These findings are consistent with those reported by Smith,26 who suggested that amateur boxers have three phases in their weight control programme: natural weight; training weight; and championship weight. In the present study, boxers indicated a difference between championship and interclub competition weight. A repeated measures analysis of variance (MANOVA) indicated significant differences (F3,42 = 82.06, p < 0.001) between boxers' perceived natural weight, training weight, interclub competition weight, and championship weight (see table 1). Follow up Scheffe analysis indicated that all mean weights differed significantly (p < 0.001), hence providing evidence to support the notion that weight manipulation is an integral part of the mindset of boxers. All boxers reported the use of dieting as a strategy for weight reduction, including eating less and restricting fluid intake, particularly in the week leading to championship competition. In terms of losing weight on the day of the weigh-in, 73% of boxers sampled reported reducing weight through exercise. The types of exercise used included long runs and skipping. Boxers indicated that they lose approximately 2–3 kg in the week leading to championship competition. Boxers also reported that weight varies during the season in the full range from natural weight to championship weight. All boxers reported use of dieting as a strategy for weight reduction, including eating less and restricting fluid intake. Participants reported eating less in the week or over a number of weeks leading to championship competition. They reported restricting fluid intake at least one day before the weigh-in for a championship competition. In some cases, participants reported restricting fluid intake to the extent that no fluid was taken for over 24 hours before the weigh-in. All boxers interviewed reported that they perceived weight reduction to be a necessary part of boxing competition and that they performed better having reduced weight. Results showed that the group reduced their weight significantly (t = 3.21, p < 0.001, effect size = 0.34; training weight: mean = 72.20 kg, SD = 11.16 kg; championship weight: mean = 68.50 kg, SD = 10.79 kg). Boxers reduced their body weight by an average of 5.16% (SD = 1.06 %; range 3.57–7.27%). At the time of the weigh-in, two participants needed to reduce weight (0.4 and 0.5 kg) to make the weight agreed for championship weight. Both boxers reduced their weight through skipping, using a sweat suit. Following the weigh-in, three participants ate a small amount of food, and all participants drank water in the two hours between the weigh-in and the performance task. This occurred after the weigh-in for the championship performance only. An accepted limitation is that these boxers were not reweighed immediately before performance to ascertain the amount of weight that was gained. Repeated MANOVA results to compare the number of repetitions performed and the number set as a goal between training weight and championship weight indicates that there was a significant multivariate effect (Wilks' lambda2,12 = 0.51, p < 0.05; see table 2; fig 2). Univariate differences indicated that boxers set a goal to complete significantly more repetitions at their championship weight (F1,14 = 13.00, p < 0.01; see table 2). There was no significant difference in performance. Thus, as fig 2 shows clearly, boxers expected to perform better at their championship weight than they did. 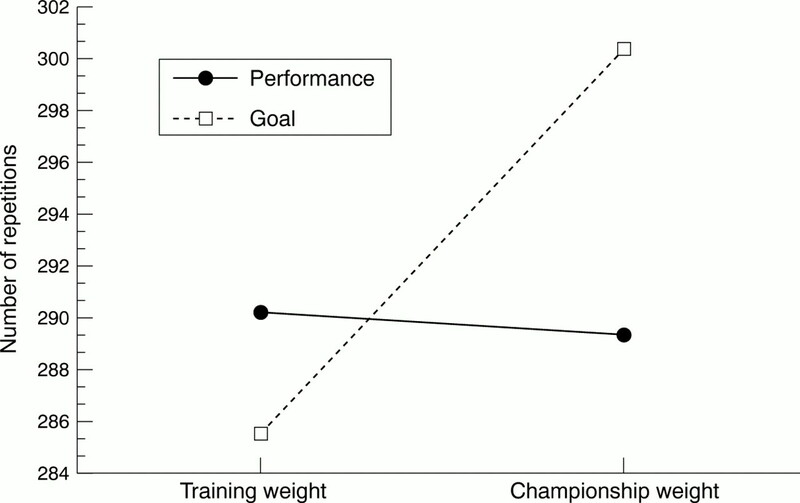 Comparison of performance and self set goals at training weight and championship weight. The purpose of this study was to investigate the effects of rapid weight loss on amateur boxing performance and mood. In the first part of the study, boxers were interviewed to identify type of strategies used to reduce weight, and to gain some insight into the perceived value of such strategies. Interviews with boxers also helped to design the measure of performance used in the present study. We hypothesised that rapid weight loss would be associated with debilitated performance coupled with increased anger, confusion, depression, fatigue, and tension, with reduced vigour. Results show that between performing at training weight and performing at championship weight, boxers lost an average of 5.16% of their body weight. As weight was lost in one week, this shows clear evidence of rapid weight loss. Rapid weight loss among boxers was associated with significantly higher scores on anger, fatigue, and tension with reduced vigour. Boxers also performed significantly below expectations. Effect sizes were high for anger, tension, and vigour. Collectively, it is suggested that findings support the hypothesis that rapid weight loss is associated with negative mood. Previous research has found that rapid weight loss is associated with poor performance.6–9 Findings from the present study show that boxers were able to maintain the standard of performance attained as a baseline score. However, when performance scores are compared with the standard of performance set as a goal, results show that boxers significantly underperformed. A particularly intriguing finding is the apparent paradox between boxers perceiving that rapid weight loss is associated with good performance and evidence showing that boxers performed significantly below expectations. It is suggested that the nature of championship boxing competition might explain the perceived benefits of rapid weight loss. It is possible that a number of contests in championship competition comprise combatants who lost a great deal of weight in the week leading up to the contest. Boxing is an interactive sport where one boxer's success is their opponent's failure. Thus it is possible for a boxer to win a contest despite performing below expectations. Winning a contest would act as positive reinforcement for using strategies to lose weight rapidly; thus winning might increase the likelihood of using these weight loss strategies in the future. By contrast, findings showing that boxers performed below expectation might suggest that boxers would view the effectiveness of such strategies more cautiously. A limitation with the present study is that monitoring of weight, performance, and mood was done over a two week period. Importantly, the potential influence of coming from a higher or lower weight when performing at training weight, with regard to mood or performance is not known. Findings of the present study indicated that making weight is an integral part of the sport and that weight varies a great deal throughout the course of a season. Kelly and colleagues9 found that wrestlers' weight also went up and down in a yo-yo like fashion. It is suggested that previous experience of the boxers would further complicate examination of this issue. Research has found that excessive use of rapid weight loss strategies is associated with greater increases in weight following rapid weight loss.10 As the sample of boxers were experienced, it is difficult to explain adequately the effects of coming from a higher or lower weight with reference to the variables examined in the present study. A second accepted limitation to the generalisability of findings from the study is the limited sample size. There is a need for research to examine the interaction among these variables using a large sample of boxers over the course of an entire boxing season where the boxers will be at each of their four weights identified in their weight making programme. In conclusion, findings from the present study indicate that rapid weight loss is associated with negative mood and debilitated performance. We suggest that there is a need for further research in this area. Bednar C. Sports under fire. www.findinglove.com/info/sportsfire.html, 1998. Hickner R, Horswill C, Welker J, et al. Test development for the study of physical performance in wrestlers following weight loss. Int J Sports Med1991;12:557–62. Keller H, Tolly S, Freedson P. Weight loss in adolescent wrestlers. Pediatr Exerc Sci1994;6:212–24. Klinzing J, Karpowicz W. The effects of rapid weight loss and rehydration on a wrestling performance test. J Sports Med Phys Fitness1986;26:9–12. Guastella P, Wygand J, Davy K, Pizza F. The effects of rapid weight loss on aerobic power in high school wrestlers. Med Sci Sports Exerc1988;20:S2. Torranin C, Smith P, Byrd R. The effect of acute thermal dehydration and rapid rehydration on isometric and isotonic endurance. J Sports Med Phys Fitness1979;19: 1–9. Choma C, Sforzo G, Keller H. Impact of rapid weight loss on cognitive function in collegiate wrestlers. Med Sci Sports Exerc1998;30:746–9. Tarnopolsky M, Cipriano N, Woodcraft C, et al. Effects of rapid weight loss and wrestling on muscle glycogen concentration. Clin J Sports Med1996;6:78–84. Kelly J, Gorney B, Kalm K. The effects of a collegiate wrestling season on body composition, cardiovascular fitness, and muscular strength and endurance. Med Sci Sports Exerc1978;10:119–24. Nelson Steen S, Brownell KD. Patterns of weight loss and regain in wrestlers: has the tradition changed? Med Sci Sports Exerc1990;22:762–7. McNair DM, Lorr M, Droppleman LF. Manual for the Profile of Mood States. San Diego, CA: Educational and Industrial Testing Service, 1971. Terry PC. The efficacy of mood state profiling among elite performers: a review and synthesis. The Sport Psychologist1995;9:309–24. Vealey RS, Garner-Holman, M. Applied sport psychology: measurement issues. In: Duda JL, ed. Advances in sport and exercise psychology measurement. Morgantown, WV: Fitness Information Technology, 1998:433–46. Gould D, Tammem V, Murphy S, May J. An examination of US sport psychology consultants and the services they provide. The Sport Psychologist1989;3:300–12. Terry P, Slade A. Discriminant capability of psychological state measures in predicting performance outcome in karate competition. Percept Mot Skills1995:81:275–86. Morgan WP, Brown DR, Raglin JS, et al. Psychological monitoring of overtraining and staleness. Br J Sports Med1987;21:107–14. Lane AM. Relationships between attitudes toward eating disorders and mood among student athletes. J Sci Med Sport. In press. Terry PC, Lane AM, Warren L. Eating attitudes, body shape perceptions, and mood among elite rowers: effects of age, gender and weight category. J Sci Med Sport1999;2:67–77. Hausenblas HA, Carron AV. Eating disorder indices and athletes: an integration. J Sport Exerc Psychol1999;21:230–58. Lane AM, Karageorghis CI. Discriminant effectiveness of goal confidence and goal difficulty in predicting goal attainment in junior high school cross-country runners. Percept Mot Skills1997;84:747–52. Lane AM, Terry PC, Beedie CJ, et al. Mood and performance: test of a conceptual model with a focus on depressed mood. Psychol Sport Exerc. 2001;2:157–72. Terry P, Lane A, Lane H, Keohane L. Development and validation of a mood measure for adolescents. J Sports Sci1999;17:861–72. Lane A, Terry P. Development of normative data for Profile of Mood States-C among adult and young athletes. J Sports Sci1998;16:94–5. Tabachnick BG, Fidell L. Using multivariate statistics, 2nd edn. New York, NY: Harper and Row, 1996. Thomas J, Nelson J. Research methods in physical activity, 2nd edn. Champaign, IL: Human Kinetics, 1996. Smith M. Fluid balance in weight categorized sports. Coaching1996;8:22.